When someone mentions San Francisco, it is hard not to think of the cradle of thriving technology-related startups, the place where some of the most successful internet companies in the global market were born. A paradise for app developers, location independent professionals and digital nomads from all over the world, this city in Northern California (USA) is worth a visit whether you come to work or simply look for inspiration. Easily accessible from the airport by car, rail or bus, downtown San Francisco welcomes young entrepreneurs, foodies and globetrotters longing for a ride in one of its cable cars or eager to explore the many allures to be found along its steep streets. Nevertheless, there is no need for thrifty travellers to break the bank in order to stay in a good location, since affordable accommodation is available in the very heart of the city. Continue reading to find out more about our recommended budget hotels in San Francisco, United States. This 2-star hotel not only boasts an exceptional location in Union Square in the downtown, but also offers guests convenient shuttle services from and to San Francisco International airport for a small surcharge. Besides, the BART Powell station lies within short walking distance provided that travellers prefer to get around on their own. The traditional cable cars are also within easy reach. The guest rooms can be standard featuring double or twin beds, deluxe ones affording beautiful city views or even have two double beds. They all include complimentary WiFi, cable TV, working area, iPod docking stations and environmentally friendly en suite showers and toilets. 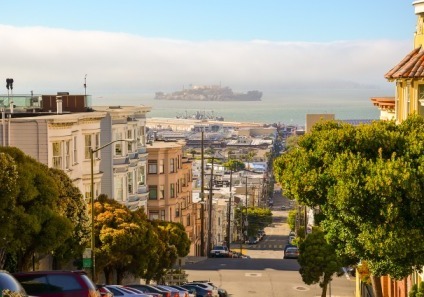 If you think it suits your needs, check availability for your trip dates at this affordable hotel in San Francisco, California. It should come as no surprise that an establishment featuring sleeping pods in the style of the famous Japanese capsule hotels exists in such a technological place. With both Asian and English-speaking personnel, the front desk of this property remains open 24 hours a day, and free WiFi is accessible throughout the entire facilities. Female and male zones are segregated so guests can enjoy the privacy of their pod in this cheap hotel in downtown San Francisco while still benefitting from communal lockers, shared bathrooms with complimentary toiletries and an onsite restaurant serving tasty local and international dishes. Are you a loyal guest to the Holiday Inn brand? If you would rather stay in a familiar place, you may also choose the Holiday Inn Express hotel in Union Square, San Francisco. Its fantastic location makes it perfect for a work or shopping trip during which you can equally live the foodie life at the many restaurants and bars of the area. The facilities feature modern rooms with private bathroom and unlimited wireless internet, and your confirmed reservation entitles you to a free continental breakfast every morning. Another perk of staying in this budget hotel in San Francisco (California) is that it has accessible rooms and bathrooms specifically designated for visitors with reduced mobility. What will your next destination in the United States be? If you need to unwind after a hectic business trip, we recommend a retreat by the sea in Venice Beach, Los Angeles.